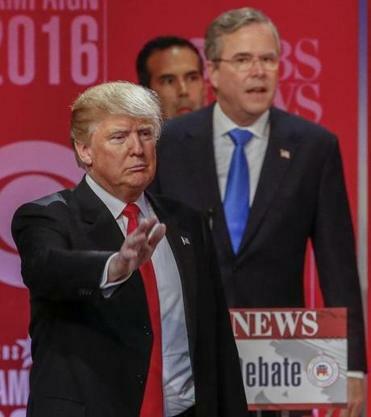 Attack on Bush legacy a risky strategy in S.C.
Donald Trump and Jeb Bush (seen after the GOP debate Saturday) fought vigorously over the presidency of Jeb’s brother George, who remains very popular in South Carolina. GREENVILLE, S.C. — George W. Bush won a bruising South Carolina presidential primary on his way to the Oval Office, as did his father before him. Now it’s his brother’s turn, and for Jeb Bush, the most consequential foreign policy decisions of his brother’s time in office are suddenly front-and-center of his bid to keep alive his campaign for the Republican presidential nomination, thanks to Donald Trump. The former president had already announced plans to campaign for his younger brother on Monday in South Carolina, marking his most direct entry into the 2016 race to date. But on Saturday, Trump used the final Republican debate before the state’s Feb. 20 primary as an opportunity to excoriate George W. Bush’s performance as commander-in-chief. The former president, Trump said, ignored ‘‘the advice of his CIA’’ and ‘‘destabilized the Middle East’’ by invading Iraq on dubious claims that Saddam Hussein had weapons of mass destruction. Trump didn’t let up as Bush tried to defend his brother, dismissing his suggestion that George W. Bush built a ‘‘security apparatus to keep us safe’’ after the 9/11 attacks. The onslaught, which Jeb Bush called Trump enjoying ‘‘blood sport,’’ was the latest example of the billionaire businessman’s penchant for mocking his rival as a weak, privileged tool of the Republican Party establishment, special interests, and well-heeled donors. But the exchange also highlighted the former Florida governor’s embrace of his family name and history as he jockeys with Senator Marco Rubio of Florida and Governor John Kasich of Ohio to emerge from South Carolina as the clear challenger to Trump, who won the New Hampshire primary, and Senator Ted Cruz of Texas, the victor in Iowa’s caucuses. The attack on George W. Bush carries risk for Trump, given the Bush family’s long social and political ties in South Carolina and the state’s hawkish national security bent, bolstered by more than a half-dozen military installations and a sizable population of veterans who choose to retire in the state. But the Bush family does have a history in the state that is hard to overlook. In 2000, George W. Bush beat John McCain in a nasty contest, marred by rumors that McCain had an illegitimate black child. McCain adopted a child from Bangladesh. Exit polls showed George W. Bush won nearly every demographic group. George H.W. Bush, the 41st president, won twice here, beating Bob Dole in 1988 and demolishing Pat Buchanan in 1992. One of the elder Bush’s top strategists, Lee Atwater, hailed from South Carolina and remains a legend in GOP campaign annals. Last week, Jeb Bush touted the endorsement of Iris Campbell, the widow of Carroll Campbell, a former South Carolina governor and a national co-chairman of previous Bush presidential campaigns. Yet even as he defended his brother’s presidency at Saturday’s debate, Jeb Bush found a way to distance himself from George W. Bush’s business affairs and to criticize Trump at the same time. The issue: eminent domain. Before entering politics, George W. Bush was part-owner of the Texas Rangers, and their home city of Arlington, Texas, used eminent domain to take private land and build a stadium for the team. Trump has defended such uses of eminent domain as a way to foster economic development. In a separate development, Mike Murdock, a prominent Texas-based televangelist, will formally endorse Trump for president at a rally in Greenville on Monday. Murdock, who frequently preaches about prosperity, arguing that a strong moral faith will lead to financial success for Christians, joins a handful of high-profile evangelists who have backed Trump. Two-thirds of Republican voters in the state describe themselves as evangelical.